BOLOGNA, Italy – Volkswagen AG will launch a small crossover below the compact Tiguan as part of a plan to expand its crossover range, design boss Walter de' Silva told Automotive News Europe. VW wants to add crossovers of different sizes and with different design characteristics to appeal to a wider audience. "Crossovers demand is expanding from mature markets to emerging markets and we have to cover this growing appetite with a multilateral expansion in the offer of our brands," de' Silva said on the sidelines of the auto show here. VW doesn't have a model in the small SUV/crossover segment, which was Europe's fast-growing niche in the first half with sales up 81 percent to 112,530 units, according to JATO data. The Dacia Duster accounted for most of the segment's growth because of its near sixfold sales increase to 76,204 units. VW also wants to launch crossovers with different looks, as previewed by the Cross Coupe concept the automaker unveiled at the Tokyo auto show last week. "The Cross Coupe is not a preview of the next Tiguan – a vehicle which will keep more traditional proportions – but a first look at how we could lure different customers in the crossover segment," de' Silva said. 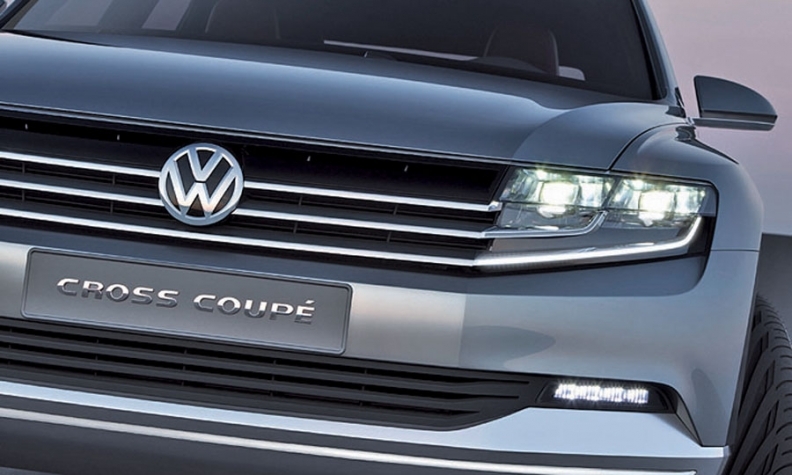 The VW Cross Coupe concept's grille and headlights are integrated -- a look that the automaker will use on future SUVs. VW brand development chief Ulrich Hackenberg told Automotive News Europe in Tokyo last week that he would like to see the Cross Coupe launched in addition to the Tiguan to create a new niche. De' Silva added that the company has not decided whether to make a coupe-SUV crossover like the Cross Coupe, but that such an architecture looks promising, especially in the world's largest market. "China is no longer a sedan-only market and is showing a growing appetite for crossovers that we need to take into account in our next product decisions," the designer said. VW says the Cross Coupe concept shows the new face of the brand's future SUVs. That face is dominated by a wide grille that integrates the xenon headlights and turn signals. "We searched intensively for something original and unique," VW brand head of design Klaus Bischoff told Automotive News Europe about the look of the grille. Bischoff, a co-leader of the team that created the concept with de' Silva, said the grille will be on a VW model in two to three years. That would coincide with the launch of the second-generation Tiguan. The concept is a plug-in hybrid that gets its power from a 147-hp 1.4-liter four-cylinder turbocharged gasoline direct-injection engine combined with two electric motors, one mounted in the front and the other in the back. The combined power rating of the engine and electric motors is 261 hp, VW says.